The Taj Mahal (Crown of Palaces) is India’s jewel. A symbol of the nation. A labour of love and an architectural masterpiece. 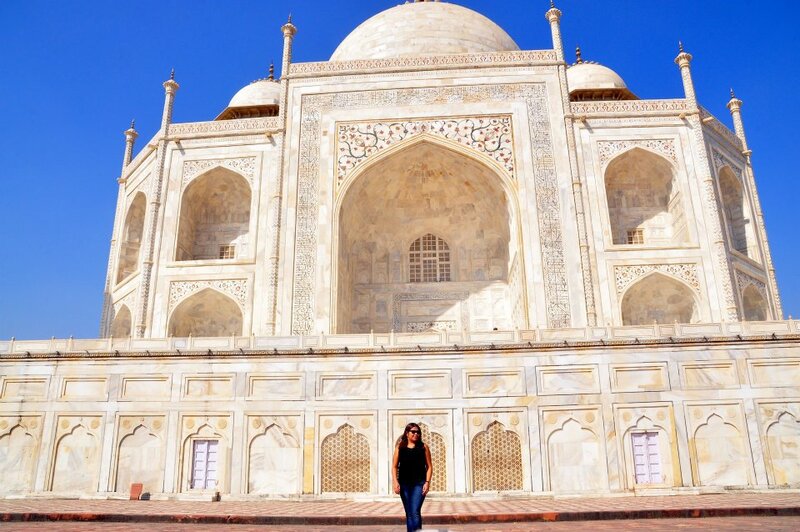 I have had the privilege to visit the Taj Mahal numerous times as a child. At any age one views it with awe and wonder. As I grew older I started to get a grasp of what the monument stood for. The connections to Agra, Uttar Pradesh (where the Taj Mahal is located) from the Nation’s Capital Delhi have improved drastically through the years- from planes, trains to automobiles. Agra now has an airport, there are hundreds of trains that you can choose from and the roads are better paved. If you’ve never been to India- driving can be nerve wracking, so if you want to arrive in one piece without hitting a cow, do take the train. It is the best example of Mughal architecture that combines Islamic, Persian and Indian influences. During the 17th Century under the Mogul Empire, its ruler Shah Jahan was highly successful and lived lavishly. There was great interest and love for the arts. Sufficient trade amongst neighbouring states and Western countries kept his people content. 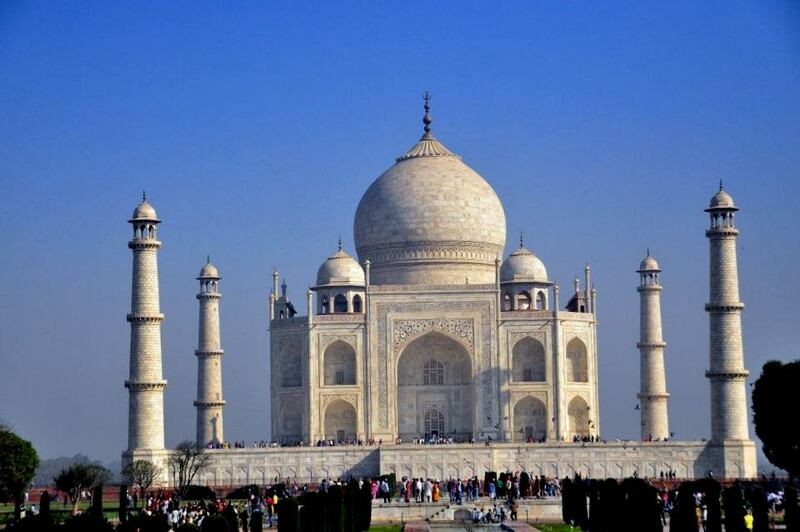 The Taj Mahal took 12 years to construct and was completed in 1648 in honour of his 3rd wife Mumtaz Mahal. Mumtaz Mahal meaning “the chosen one” was not only a lover to Shah Jahan. They travelled together and served as his close confidant. He loved Mumtaz deeply. It is said that after giving birth to their 14th child, she became unwell. On her deathbed, Mumtaz whispered in Shah Jahan’s ear and requested that a Mausoleum be erected in her honour. After 2 years of mourning, he kept his promise and began construction. Imagine a person so smitten, not only willing to take care of your burial expenses but build an entire structure in your honour. We would be lucky to get a fancy Urn at our rites! 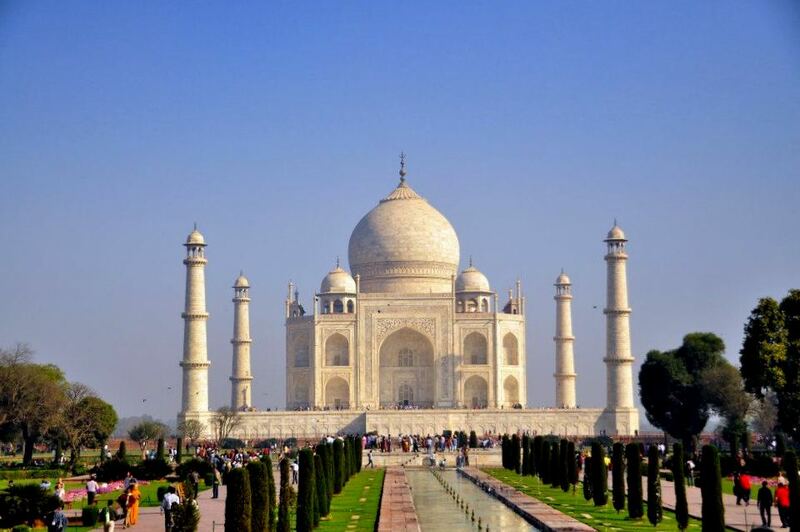 Agra is a tourist town. It lives and breathes the Taj Mahal. There are approximately 3 million visitors each year. The main centre is crowded-full of people trying to sell Taj Mahal memorabilla. Dancing monkeys and snake charmers hound you outside the walls of the tomb, which can be overwhelming to most. Princess Dianna was privileged to have the place all to herself. Upon arrival this time I rented a taxi to get around. It always gives an opportunity to brush up on the language and chit chat about the city with the taxi wallah (man). There is high security around the Taj. 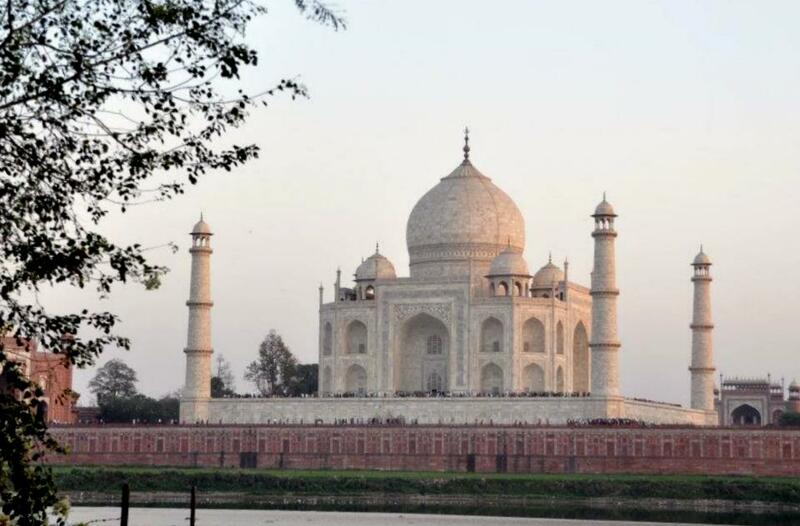 India takes terrorism very seriously and having 7 countries near the border, the government supplies extra troops to Agra to protect the World Heritage treasure. To an average foreigner it will cost about $12 to enter and 30 U.S. cents for locals. My friends are not thrilled by the difference. People visiting are instructed to take an electric bus and have to walk quite a distance. Do not bring a bulky bag or camera equipment, if so it will remain in a locker before entering. 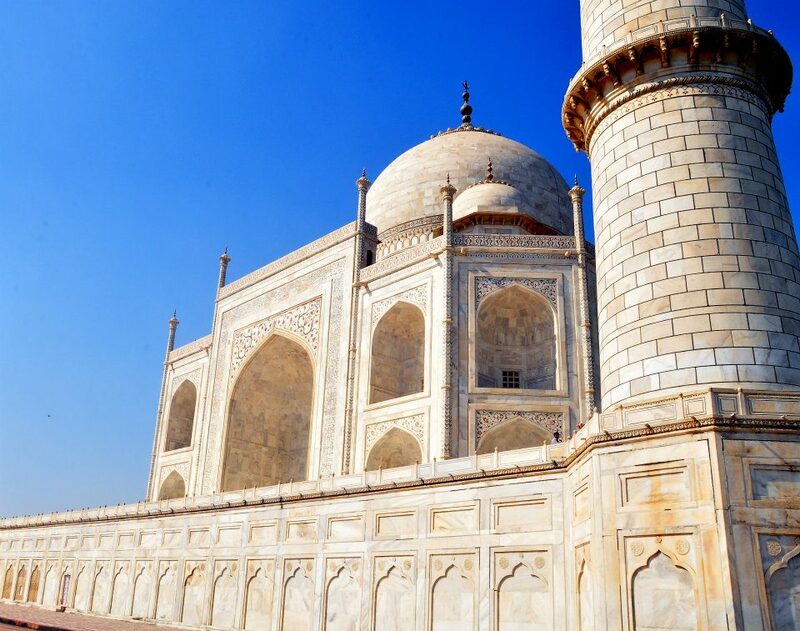 The city of Agra has tried desperately to lessen the air pollution around the Taj Mahal to keep its white marble pristine. 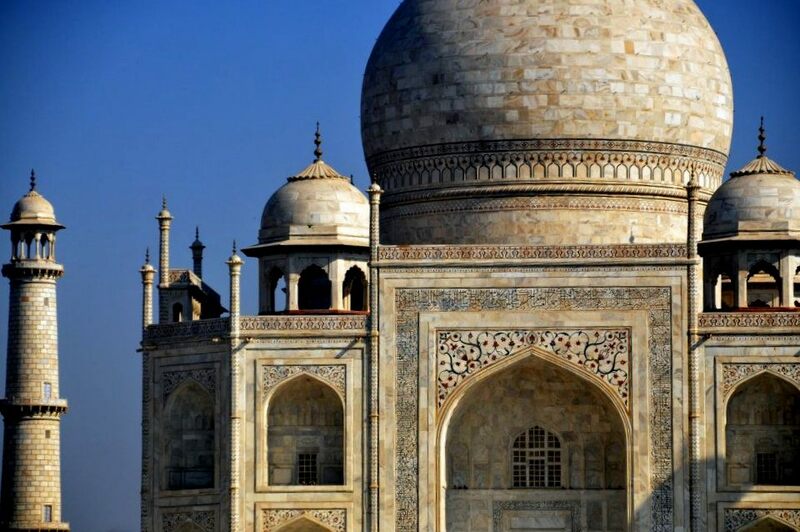 The Taj Mahal’s architecture embodies the duality of life and death. The optical illusion created on the first view from the main gate is surreal. As a visitor gets closer- the Taj seems smaller than when you walk away. The symbols and ideals are based from the Koran. The red sand stone used before entering the passage way represent worldly elements. The smooth glowing white marble stone for the main monument and tomb represents spirituality and faith. The 4 channels represent the rivers of paradise. Where these sections meet symbolizes the point where one relinquishes their thirst before entering paradise. The minarets are built to slightly tilt outwards to save the main structure from any earthquake or disaster. Latticework covers the entire interior. 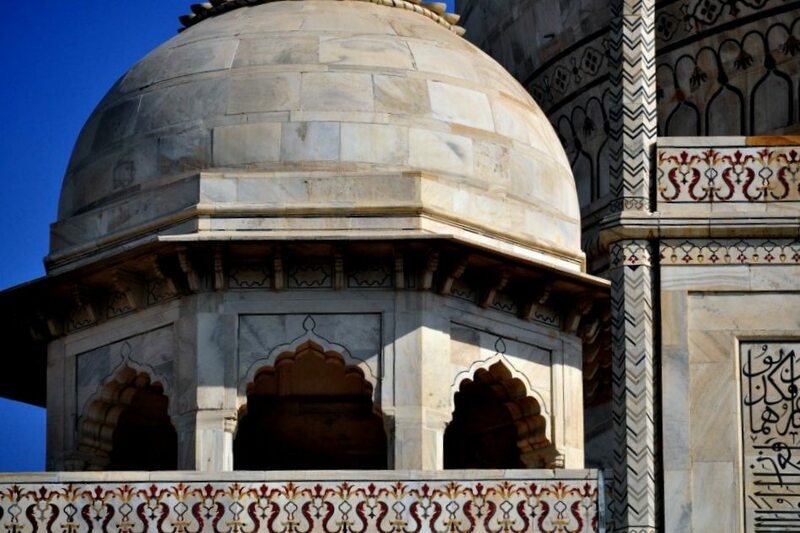 Mumtaz’s actual tomb is located below the Taj’s structure through a secret passage not open to the public. A replica of the original tomb is on display above for tourists. A technique called Pietra Dura which was handed down to the Mughals by Italian Traders is a process of mosaic and inlay work of gemstones set into marble. This intricate detail work can be seen throughout the Taj. What people fail to realize is that for well over a decade it took to create it, thousands of craftsmen, artisans, masons and slaves were hired. There is no chronicle of the exact amount of people used for hard labour. Many lost their lives in its construction, and the empire’s resources were drained, which lead to Shah Jahan’s downfall. The dilemma created by the Taj is still relevant today. As my driver dropped me off at Mehtab Bagh (Moonlight Garden) north of the Taj, I noticed how difficult it was to get around the city. In fact it was fairly dusty and dirty. The view from the garden is spectacular as it is located on the opposite side of the Yamuna River and is perfectly aligned to the Taj Mahal. My driver was getting a bit restless and wanted to get back to his house before dark. At night fall there are restrictions for the locals who live in its vicinity. They are not allowed out of their houses for security reasons. Some are given certain passes to be able to remain mobile. “Where is the beauty in the Taj yaar (friend)? They don’t see our problems. “he said with a sound of exasperation in his voice. I didn’t know what to say. There was a large group of tourists from China who were being hounded by hawkers. The scene across the river with the dusky sky reflecting off the white marble gave off an eerie feeling. I took a few photographs and left with him in silence. The irony is even though the Taj Mahal embodies such great beauty and love; it is capable of bringing misery and untold sorrow to others who live around it. An endless cycle of generations competing and striving to earn a living off this spectacular maselouem. Shah Jahan in his later years was stripped of his power and held captive by his own son. The empire left in ruins. 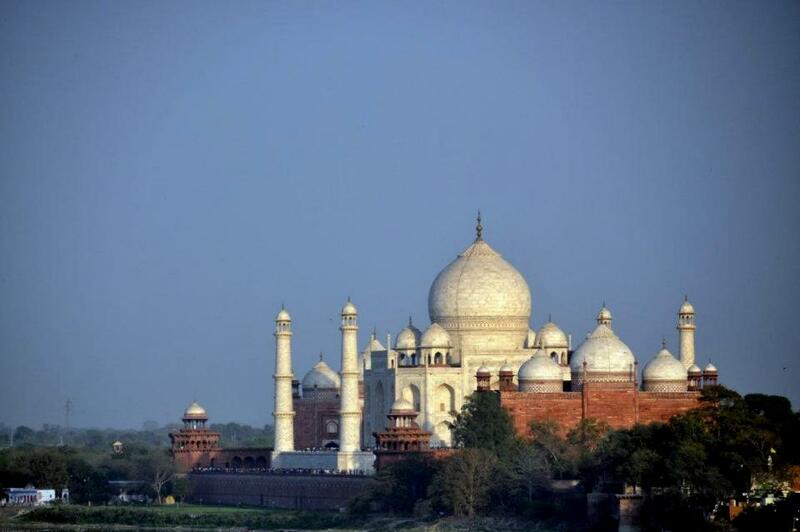 He viewed his Taj Mahal from across the river through a prison cell. 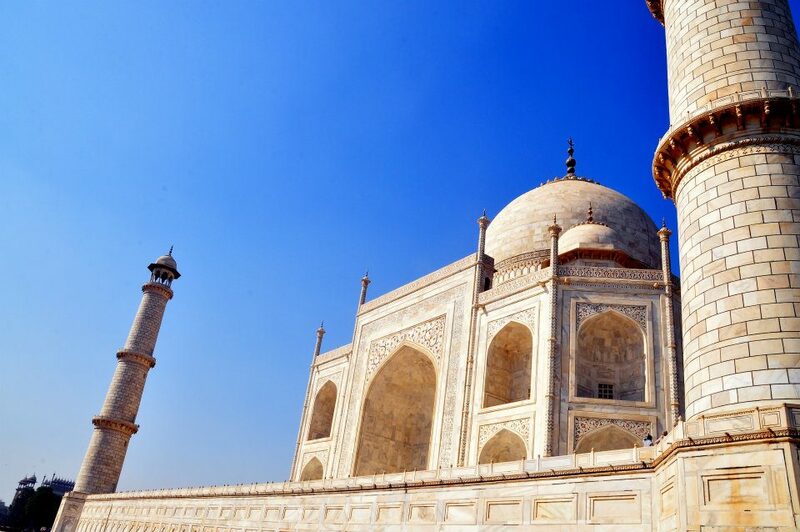 Shah Jahan was buried next to the love of his life Mumtaz Mahal, a broken man. We can only hope and romanticize for a love as blind and unconditional. If lucky, maybe once in a lifetime.